A picture says a thousand words? Well, I think that picture above is baffling. 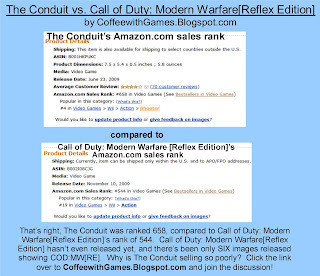 I'm baffled at how Call of Duty: Modern Warfare [Reflex] has a higher sales rank on Amazon.com, than The Conduit does. Why do I find it baffling? How/why is it that Call of Duty: Modern Warfare: Reflex has a higher sales rank than The Conduit? I'm a huge fan of Call of Duty: World at War, but that doesn't mean I'm going to reserve or purchase Call of Duty: Modern Warfare [Reflex] without knowing/seeing more about the game. Most of the gamers I've seen talking online, have some reservations about Call of Duty: Modern Warfare [Reflex] because there is so little information that has been provided on the game. Also, I know The Conduit's online is a glitchfest, and because of that, sales have probably slowed as word-of-mouth spread about the problems with multi-player, but I definitely don't think enough information is known about Call of Duty: Modern Warfare [Reflex] to justify purchasing it now. What do you think? 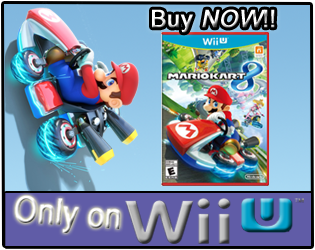 Have you reserved or already purchased Call of Duty: Modern Warfare [Reflex] for the Wii? Do you plan on buying Call of Duty: Modern Warfare [Reflex]? *Pictures were captured off Amazon.com around 3a.m. on Friday, October 30. I did reserve it. i stood in line for an hour and a half @ midnight. (w/ 1000 MW2 People)Took it home and spent the next 10 hours to kill-in gamers around the world. I had the hardest time connecting with someone in the US 45 mins after the release. But there were enough around the world to play with.I love it for whats it's worth.I personally am happy I got it. I can only be mad at my self for not having an 360 or a PS3 and not having the means to have MW2. WAW was me favorite game in the last 8 months and haven't played since 10:30 Monday night. Thanks for the comment! I haven't picked up COD:MW[R] for the Wii...yet! COD:WaW is my most played Wii game, and I haven't even played it really since about September. If COD:MW[R] is as good as, or better than COD:WaW, then I can see it providing months of game play. Being that you played COD:WaW, what do you think of COD:MW[R] compared to COD:WaW? Do you think the reviews are correct in saying the controls are an issue in COD:MW[R]? Or do you think the reviewers didn't spend enough time with the game to get used to the controls? The Beach or The Gym? 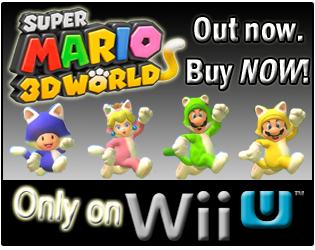 The Nintendo Channel Update, Finally Updates! Nintendo of America's System History via Video.